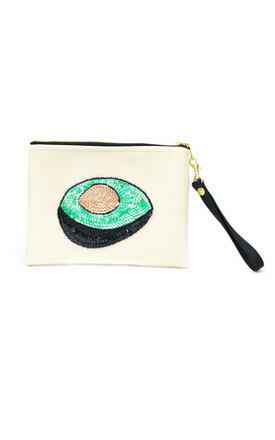 Cream vegan leather clutch bag with a gold zip and detachable wrist strap. Hand stitched bead embroidery. Treat with care. Bright patterned cotton lining. One size 20 x 16.5 cm. Black Leather Jean only. Fitted shape and sizes are on the small side. Model is 177cm/ 5'10" and is wearing an IT size 40. Each vegan leather clutch bag is exclusive and individually designed by Tea & Tequila Trading blending their inspiration and love for traditional Mexican art and craft with their inherently London/British style. The sequin patches are hand-crafted by highly-skilled embroiderers in Mexico city, the designs are carefully paired with a bright yet durable fabric, and our clutch bags are created by talented seamstresses also in the capital; the colourful cotton linings are sourced from Oaxaca City and include traditional aztec patterns in the weave.